The black Source Four Fresnel Zoom to Focus Fixture from ETC brings you the soft-focus lighting and sparkle you love with Source Four quality and efficiency. A combination of the Source Four HPL lamp technology and the traditional Fresnel optics enables you to use the lamp inventory of this fixture with a single source, the HPL. 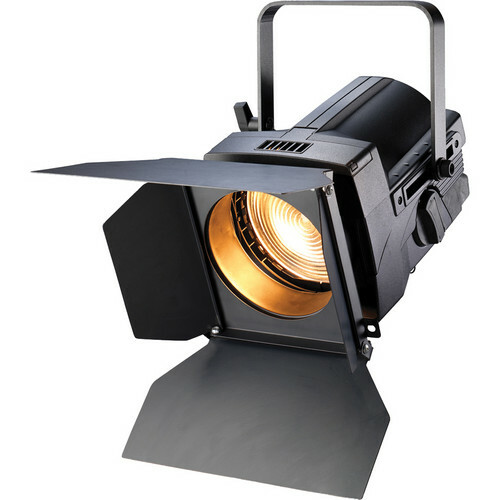 With the Source Four Fresnel Fixture, you can choose the lamp wattage that best suits your particular application and energy requirements, from 375 to 750W lamps. When you need to relamp a Source Four Fresnel Fixture, ETC’s smart design makes your work easy. The socket and access door let you change out the lamp from underneath the fixture without having to break focus saving on work, time, and trouble. The fixture-housing is engineered to eliminate light leaks and minimize spillage. The innovative mechanical design of this fixture has simplified focusing for you. Whatever physically awkward spot you’re working in, the fixture can be easily adjusted from spot to flood, with a full-sized zoom knob you can get a real grip on. Spot-to-flood focus is accomplished by large, easy-to-use knob for quick adjustments in inconvenient positions. The Quick eXchange socket design permits re-lamping from underneath the fixture without breaking focus in most situations. Box Dimensions (LxWxH) 15.1 x 12.6 x 12.6"